Astronautics (optimisation of paths generation, computation of orbits or arcs of orbits, optimisation of interorbital transfer, synchronous orbits, astro-relativity, rarefied atmosphere flight, recovering in high density atmosphere, braking and interception of spatial vehicles). Aeronautics (aerodynamics, flight theory, aeroelasticity, aerodynamics of internal combustion engines, aerothermodynamics of jet engines). Fluid mechanics (dynamics of newtonian and of non-newtonian fluids, dynamics of compressible fluids, flow of miscible fluids, flow of fluids through porous media). Hydromechanics (hydraulics, hydraulic structures, hydraulic turbines and pumps). General mechanics (elasticity, plasticity, elastoplasticity, viscoelasticity, viscoplasticity, strength of materials, vibrations, stability). Mechanical engineering (kinematics and dynamics of mechanisms, friction, wear, lubrication, new methods for the analysis of machines, automation, study of surfaces, technology of solids). Civil engineering (methods for the static and dynamic analysis of structures, study of heterogeneous materials, soil mechanics and stability, new construction methods). Measurement technique (electronic equipment for measuring mechanical quantities, use of ultrasonics and radioisotopes in technique). Astronautique (réalisation de trajectoires optimales, calcul des orbites ou dessegments d'orbites, obtention du transfert interorbital optimal, orbites synchrones, astrorélativité, vol en atmosphère raréfiée, rentrée dans l'atmosphère dense, freinage etsaisie des véhicules spatiaux). Aéronautique (aérodynamique, théorie duvol, aéroélasticité, aérodynamiquedes moteurs à combustion interne, aérothermodynamique des moteurs à réaction). Mécanique des fluides (dynamique des fluides newtoniens et des fluides non-newtoniens, dynamique des fluides compressibiles, écoulement des fluides miscibles, écoulements dans les milieux poreux). Hydromécanique (hydraulique, constructions hydrotechniques, turbines hydrauliques et pompes). Mécanique générale (élasticité, plasticité, élastoplasticité, viscoélasticité, viscoplasticité, résistance des matériaux, vibrations, stabilité). Constructions mécaniques (cinématique et dynamique des mécanismes, frottement, usure, lubrification, méthodes modernes de calcul des machines, automation, étude des surfaces, technologie des solides). Statique et dynamique des constructions (méthodes de calcul statique et dynamique des constructions, étude des matériaux hétérogènes, mécanique et stabilité des sols, méthodes d'exécution des travaux de construction). Techniques de mesure (appareils électroniques pour la mesure des grandeurs mécaniques, utilisation des ultra-sons et des isotopes radioactifs en technique). The submission of a manuscript carries with it the author's assurance that it has not been copyrighted or published elsewhere (except in the form of an abstract or as part of a published lecture, review, or thesis); that it is not under consideration for publication elsewhere; that its publication has been approved by all coauthors, if any, and, after being accepted by Romanian Journal of Technical Sciences - Applied Mechanics, it will not be published in another journal. Romanian Journal of Technical Sciences - Applied Mechanics is a peer reviewed journal. The scientific papers submitted for publication in this journal are reviewed by two scientists in applied mechanics and mechanical engineering in order to get their opinion on the quality and novelty of the submitted paper, its relevance to the field, its appropriateness for the journal, etc. The reviewers remain anonymous to the authors. They do not act as a group, do not communicate with each other, and are not aware of each other's identities or evaluations. The role of the reviewers is advisory, and the editor is under no formal obligation to accept their opinions. The opinions of the two reviewers are judged by the editor, i.e., the Scientific Editorial Board of Romanian Journal of Technical Sciences - Applied Mechanics. If reviewers' opinions coincide or are very close, so they agree, then the editor follows these opinions. But if the reviewers disagree substantially about the quality of a work, e.g., very positive and very negative reviews for the same manuscript, then the editor firstl y asks further details from the reviewers, and then invites the authors to correct and improve the paper so that to respond to the negative opinion of one of the reviewers. The editor may also ask for one or more additional reviews as a tie-breaker. Finally, the editor makes the decision concerning the publication of the paper. 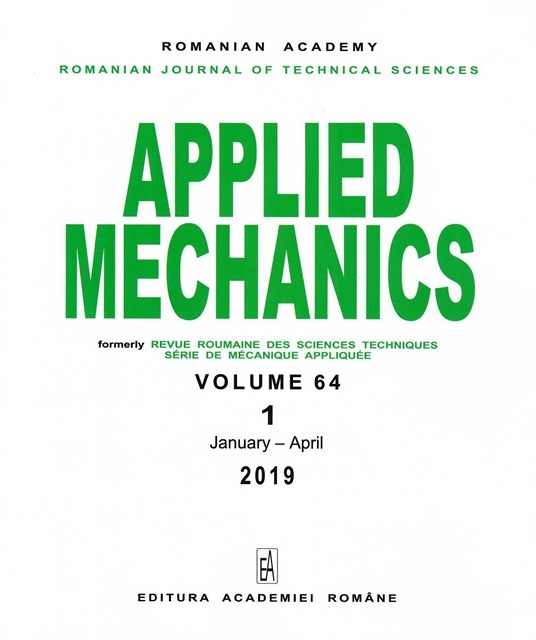 The publication of an article in Romanian Journal of Technical Sciences-Applied Mechanics (RJTS-AM) represents a process of continuous enrichment of scientific knowledge. RJTS-AM is a peer-reviewed journal. The scientific papers submitted for publication in this journal are reviewed by at least two scientists in applied mechanics and mechanical engineering in order to get their opinion on the quality and novelty of the submitted paper, its relevance to the field, its appropriateness for the journal, etc. For all parties involved in the act of publishing (the author, the journal editors, the peer reviewer and the publisher) it is necessary to agree upon standards of expected ethical behavior. The ethics statements are headed by Scientific Editorial Board of Romanian Journal of Technical Sciences-Applied Mechanics, which takes its duties of guardianship over all stages of publishing. Authors reporting results of original research should present an accurate account of the work performed as well as an objective discussion of its significance. Underlying data should be represented accurately in the manuscript. A paper should contain sufficient detail and references to permit others to replicate the work. Fraudulent or knowingly inaccurate statements constitute unethical behavior and are unacceptable. The editor may return manuscript in which deception or fraudulent statements are presented given the research justification. The articles must be accurate, objective, and clearly. The authors should ensure that they have written entirely original works, and if the authors have used the work and/or words of others that these have been appropriately cited or quoted. The multiple forms of plagiarism constitute unethical behaviors and they are unacceptable. Authorship should be limited to those who have made a significant contribution to the conception, execution, or interpretation of the reported study. All those who have made significant contributions should be listed as coauthors. Where there are others who have participated in certain substantive aspects of the research project, they should be named in an Acknowledgement section or listed as contributors. The corresponding author should ensure that all appropriate co-authors (according to the above definition) and no inappropriate co-authors are included in the author list of the manuscript, and that all co-authors have seen and approved the final version of the paper and have agreed to its submission for publication. If the work involves procedures or equipment that have any unusual hazards inherent in their use, the authors must clearly identify these in the paper. All authors should disclose in their manuscript any conflict of interest that might be construed to influence the results or their interpretation in the manuscript Examples of potential conflicts of interest which should be disclosed include employment, consultancies, patent applications/registrations, and grants or other funding. Potential conflicts of interest should be disclosed at the earliest stage possible. When an author discovers a significant error or inaccuracy in his/her own published work, it is the author's obligation to promptly notify the journal's editor or publisher and cooperate with them to either retract the paper or correct the paper. When summiting a scientific paper for publication, the authors must send also a Submission Letter, according to the provided model. If asked, the authors must perform the modifications suggested by the reviewer. If the authors do not answer to this query concerning paper modifications following the review process in a reasonable amount of time (6 months), then the paper is automatically rejected for publication. The editors follow current requirements regarding libel, copyright infringement and plagiarism. They are responsible for publication of papers in optimal and timely conditions time. An editor is guided by the policies of the journal's Editorial Board and may confer with other editors or reviewers in making the publication decision. An editor should evaluate manuscripts for their intellectual content without regard to the author's race, gender, sexual orientation, religious belief, ethnic origin, citizenship or political philosophy. The editors and any editorial staff must not disclose any information about a submitted manuscript to anyone other than the corresponding author, reviewers, potential reviewers, other editorial advisers or the publisher, as appropriate. Unpublished materials disclosed in a submitted manuscript must not be used in an editor's own research without the express written consent of the author. In case of any conflict of interest, the editors should require members of Scientific Editorial Board to disclose relevant competing interests and publish the obtained corrections. Peer-review assists the editor in making editorial decisions and, through the editorial communications with the author, may also assist the author in improving the paper. Peer-review is an essential component of scholarly communication. Any manuscripts received for review must be treated confidentially. They must not be shown to or discussed with others except as authorized by the editor. Unpublished materials disclosed in a submitted manuscript must not be used in a reviewer's own research without the express written consent of the author. Privileged information or ideas obtained through peer review must be kept confidential and not used for personal advantage. Reviewers should not consider manuscripts in which they have conflicts of interest resulting from competitive, collaborative, or other relationships or connections with any of the authors, companies or institutions connected to the papers. The authors are fully responsible for the originality and the content of their articles. CATALIN R. PICU, DAN MIHAI CONSTANTINESCU Editorial of the Special Issue "Advances in Computational Materials Science"
2015 No. 1-2 - "RECENT ADVANCES IN CONSTITUTIVE MODELING OF METALLIC MATERIALS"